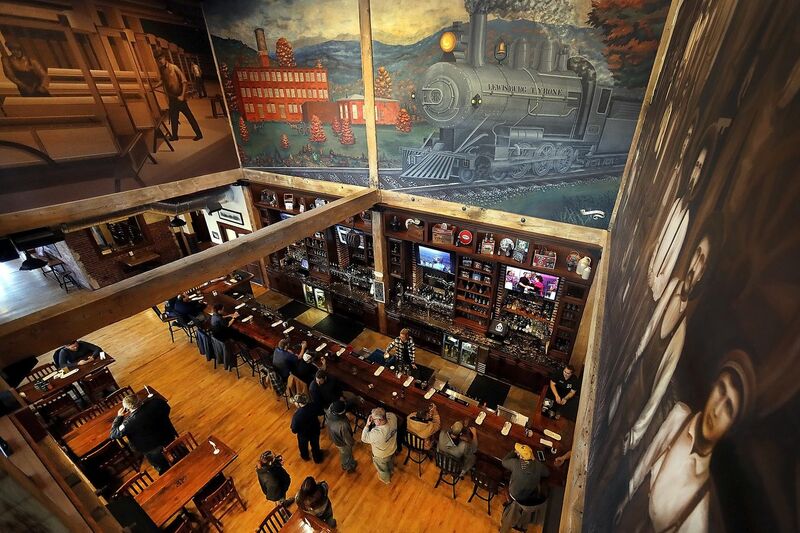 The main bar of the Rusty Rail Brewery Company in Mifflinburg, Union County, under artwork recalling the 19th century rail line that ran through town. MIFFLINBURG, Pa. — Horse-drawn buggies sit at red lights here, just feet from the quaint Colonials that line Chestnut Street. Head east, and there are miles of rolling farmlands. To the west, it’s the same. But a small detour just a few blocks off Mifflinburg’s main drag reveals a brick warehouse that’s equal parts brewery and museum, with a boutique hotel and wedding facility above it, to boot. Rusty Rail Brewing Co.’s mind-boggling 37,500 square feet of space seems as if it could seat every resident in this central Pennsylvania town of 3,600. The brewery is adorned with murals and images of Mifflinburg’s industrial past, not to mention a few restored Model T Ford trucks that were partly built there. Rusty Rail, which sits next to a 19th-century railroad line, has the scope one would expect to see at Disney World, not Union County, but Alison Feeney, a professor of geography and earth science at Shippensburg University, said more and more breweries like it are drawing tourists and preserving history across the great expanse between the state’s two largest cities. “History can be perceived as dry and boring, and when you can go and sit in a place like this, and have a beer, it’s a really cool experience,” said Feeney, author of For the Love of Beer: Pennsylvania’s Breweries. From the main dining room at the Rusty Rail Brewing Co., the brew room is visible through a glass wall where a brewer works on the brite tanks. Pennsylvania, according to the Brewers Association, makes the most beer in the nation, at 3.7 million barrels annually, and only five states have more than its 282 craft breweries. Some brewers, such as Yards of Philadelphia, Tröegs of Hershey, and Appalachian Brewing Co. of Mechanicsburg, are widely distributed, with large brewpubs. Rusty Rail is rapidly expanding, pushing its beers into Pittsburgh and Philadelphia. Rusty Rail brewed 1,000 barrels in 2015, its opening year, and 5,000 barrels last year. After pouring millions of dollars into the husk of the century-old Mifflinburg Body Co., the brewer is trying to draw in beer enthusiasts who will travel far and wide for a pint. The Selin’s Grove Brewing Co., in downtown Selinsgrove, Snyder County, brews just under 300 barrels a year and doesn’t sell wholesale, but is in the mansion of Pennsylvania’s third governor, Simon Snyder. The property, listed in 1978 on the National Register of Historic Places, was formerly used as a gift shop. McNabb said she’s named beers after Gov. Snyder, and her Captain Selin’s Cream Ale is named after the town’s founder. Brewpubs in Gettysburg have built around the history there as well, and in Shamokin, a former mining town in Northumberland County, the Lost Mined Brewing Co. was built to resemble a coal mine. In Pittsburgh’s Lawrenceville neighborhood, craft brewing was responsible for saving a building few other businesses could have repurposed: a Roman Catholic church built in 1902. The main entrance to the Rusty Rail Brewing Co.
At a recent Brewers of Pennsylvania meeting, president Chris Lampe, of Easton’s Weyerbacher Brewing Co., talked about breweries as economic engines, often anchoring distressed sections of cities. He cited breweries in Bethlehem and Allentown as examples. “When you open a brewery, other businesses tend to follow,” Lampe said. Juniata College and Penn College of Technology both have brewing courses. And Shippensburg, thanks to a Pennsylvania Liquor Control Board grant, also will be offering “brew science” courses. With brewing a $1.1 billion industry in Pennsylvania, Feeney said, the goal of the programs is to get more skilled workers who are ready to brew, rather than apprenticing at a brewery for years. Chestnut Street in Mifflinburg, Union County, where the Rusty Rail Brewing Co. thrives. Feeney said about 100 active or pending breweries are in areas designated as rural by the U.S. Census Bureau. “These breweries are preserving small traditional main streets, renovating unique architectural buildings, and telling local stories with their naming of their beers,” she said. The owners of Rusty Rail, Paul and Eric John, made their money building modular homes and purchased the sprawling Mifflinburg warehouse in 2006. The brothers, Schrader said, basically loved beer and craftsmanship, which explains the level of detail that went into the brewpub. Rich Schrader, general manager of the Rusty Rail Brewing Co., in the brew house visible from the dining room of his Mifflinburg business.